I decided to play with the Mojo sketch today & try to make some sort of LOVE card. I say some sort of because I just realized that I do not have ANY Valentine stamps & I'm still trying to figure out how that happened LOL! This is where creativity has to kick in big time for me if I'm going to send my friends cards for that special Holiday!!! Thank so much for stopping by & have a great rest of the day!!!! Love the red and white and that stamp is great. Thank you for sharing with us at Lady Anne's Challenges. I hope we see you again soon. Jackie, this card is gorgeous! Love the flowers and the ribbon is placed so well. Great quote, too! Love it!!! Such a pretty card! I love the crocheted flowers...so lovely! Just beautiful. Love the red and pink combo. Your little flowers are so cute. Thanks for joining us at TTCRD. Jackie, this is spectacular. Lovely composition, perfect papers and details. Gorgeous work. Oh, this is so beautiful! Those crocheted flowers are a stunning embellishment to a lovely card. Thanks for playing along with Mojo Monday! Way to go with those challenges! This is beautiful I love those pretty flowers! Jackie, this card turned out great! I love the pink with red and the stamp is perfect. I love this card. I don't know if its the red & white, the crocheted flowers, the sentiment, or what. Its a beautiful card. I think your stamp made for a perfect Valentine card! Love the crocheted flowers too. Thanks so much for joining us in our "Circles" challenge at Clear It Out challenges. We hope to see you again. Great card, thanks, for joining us for Vickies challenge at Lady Anne's. Oh what a pretty card-- I love those crocheted flowers-- I wish I could make my own :) Thank you for creating with us at Fresh Brewed Designs! fabulous card and I love the flowers! Love the color combination. Those crocheted flowers are great. Thanks for joining us at Tuesday Throwdown for this challenge. Oh my Jackie that is a beautiful card. I loved that DSP and its so nice to see it again. LOVE LOVE LOVE those flowers and your ribbon. Wow so many challenges too - great going girl! Soo pretty! Thanks for playing along at OCS. Whoa Jackie, this blows me away. Wonderful design! GREAT card jackie! I love the color scheme and the flowers are perfect! been thinking of you and thought i'd drop by. beautiful card. Wow, this is absolutely gorgeous! Who needs valentine stamps! The colors and papers a so yummy! I love those crocheted flowers. That is the perfect sentiment. so lovely! thanks for playing along at The Pink Elephant! Jackie this is lovely! Your flower embellishments are wonderful and that sentiment is fantastic. So pleased you could join us at The Squirrel and The Fox, and good luck in the draw. Oh I recognize this paper, I hoarded a ton of it, lol! Beautiful Jackie - just like yoU!!! Blessings, sweet friend! What a truly gorgeous creation! Such fabulous colour matching... I love the layout too! Thank you so much for joining our Anything Goes challenge at The Squirrel & The Fox... and good luck! Hi Jackie! Gorgeous card! Love your image and embellishments. Perfect and lovely!!! Thanks for joining us at the Fresh Brewed Blog for our Anything Goes challenge. Jackie, this is gorgeous!! I love how you layered the flowers! Stunning colour combo! Thanks for joining us on Tuesday Throwdown. See you again next week. A fabulous card. Thank you for joining us at Craft-Room Challenge. Hi Jackie thanks for commenting on my blog and letting me know you found me at the outlawz. I will become a follower of yours too. Love you valentines card, cute flowers. WOW, Jackie, this is a stunner! Love the monochromatic look. Thanks for sharing at TTCRD! This is gorgeous, Jackie! Love the whole color palette and beautiful details!! Wow, what a lovely card. Thank you so much for joining our Anything goes Challenge at Bearly Mine this time. This is adorable and sweet! Love the red and pink! Love the colors and details of this card! Just beautiful! I really love those flowers! Thanks for sharing it with us at Clear it Out for our Circle Challenge! This is stunning! Your attention to detail is wonderful and your eye for composition, oustanding! 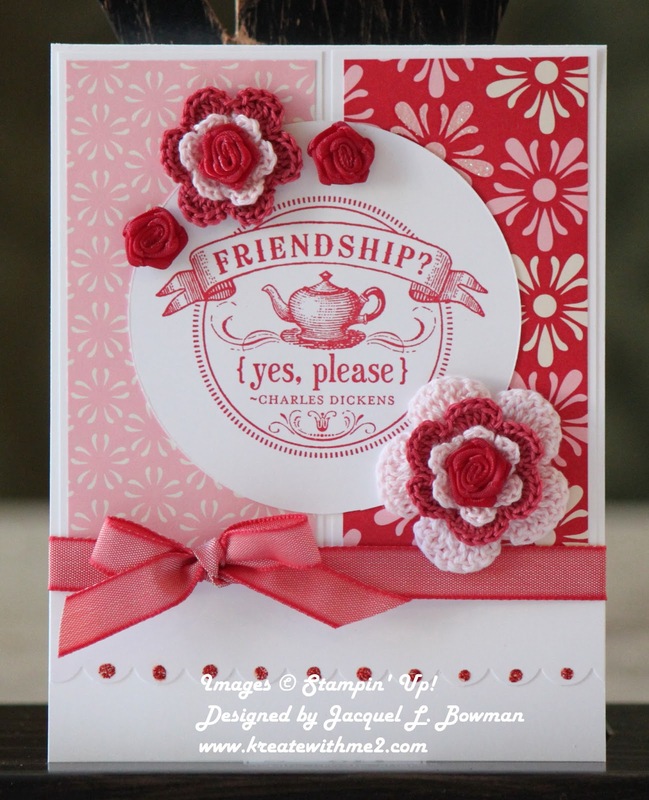 Thanks for sharing this beauty with us at Crafter's Cafe Challenge Blog! Beautiful!!! Thank you for joining us at Really Reasonable Ribbon's Challenge this week!!! Jacki this is stunning, love the monochromatic look, wow! Thanks for joining us at Lady Annes (Nana Vic's) and I hope we see you again soon! G'day Jackie, I really didn't have to stretch the imagination at all to see the love that went into making this stunning card. Thank you for joining in the fun at Lady Anne's Challenges (Nana Vic) We look forward to seeing your next creative project.